A "Wine of a Time"
World Wine Source and Education honored the independent film, “From Ground to Glass,” at Tournament Players Club (TPC) in Valencia. World Wine Source and Education’s Sommelier, DiMaggio Washington, and Event Coordinator, Alisha Maines, hosted the event bringing together the producer and guest Winemasters with local wine enthusiasts. The evening of insights was accented with culinary delights and excellent wine pairing. “From Ground to Glass” is a film about the passion, for the passion of making wine, said special guest and Winemaster West Hagen. Amateur wine-maker and producer of the film, Rob DeFoe, takes his audience on a journey of making wine for the first time while going through all of the ups and downs; the triumphs and losses; and the undying passion for every moment of it along the way. Special guests, Rob Dofoe and two Winemasters from the film spoke to the guests. Chuck Ortman, the Winemaster of Ortman Family Vineyards in Paso Robles, CA, has nearly 40 years of winemaking experience and is recognized as one of California’s most accomplished winemakers. Also speaking, West Hagen, of Clos Pepe Vineyards in Lompoc, CA, has run the show as Vineyard Manager and Winemaker at Clos Pepe since 1998. Chef Daniel Otto of TPC created an exquisite four course feast to pair with the featured wines of the evening. Herb crusted salmon and roasted pork medallions were some of the tantalizing flavors presented to complement the wines: Grenche Blanc (Curran) 2007, Chardonnay (Ortman Vineyards) 2007, Pinot Noir (Clos Pepe) 2005, Port (Heitz Cellars) or Desiree Dessert Wine (Rosenblum Cellars). Rob Dofoe, the producer, spoke of his passionate desire to make wine – – but how? Making a film about it might induce people to help. And help they did. He shared some thoughts and moments about the film as the first course was served. Ortman introduced his Chardonnay as it was served with the second course and briefly spoke about the wines of the Paso Robles region. Finally, Hagen charmed the guests when introducing his Pinot Noir with the main course. Comparing an ideal Pinot Noir to really great Jazz music sparked smiles around the room. He stressed that it should enhance the cuisine not overwhelm it. At the close of the evening, the three honorary guests signed posters and DVDs as requested by many of the local wine loving guests. World Wine Source and Education is an educational company about the world of wine. The company’s Sommelier, DiMaggio Washington and Event Coordinator, Alisha Maines, facilitate anything from events to world recognized certification courses, such as, Wine and Spirit Education Trust (WSET), www.wsetglobal.com. “Educating the world one glass at a time.” To find out more, please visit www.worldwineeducation.com. “Ortman Family Vineyards is founded on four decades of experience.” The wines are made by the father-and-son team, Chuck Ortman and son, Matt Ortman. To find out more, please visit www.ortmanvineyards.com. “Clos Pepe is a family-owned vineyard and winery set in the heart of the Santa Rita Hills of Santa Barbara County, California. Of the 29 acres planted in vines, 25 acres are planted in Pinot Noir, and 4 acres in Chardonnay.” (Clos Pepe website). To find out more, please visit www.clospepe.com. 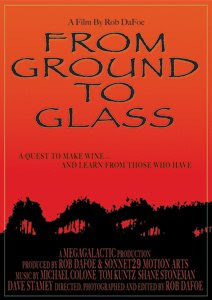 For more information about the film, “From Ground To Glass”, please visit www.fromgroundtoglass.com. For more information about the Tournament Players Club in Valencia, CA, please visit www.tpcvalencia.com.